Valentine’s Day Outfit is Also Great for the Holidays	No ratings yet. It is that time of the year, Valentines day is here again! It is actually one of my favourite holidays…..although I feel like I say that about every holiday haha. I love Valentines day because I love the idea of celebrating love and taking the time to make the day special. For this outfit I decided to go for a more subtle Valentines Day look. I am wearing this lips sweater from Forever 21, which is currently still in stores! and on sale! check out the link below. I layered the sweater over a white chiffon blouse just so that I have a little bit of white peaking through to break up the outfit. I paired it with a plain pleated black skirt and Fishnet tights to give the outfit some interest. I also wore one of my favourite coats ! I love how simple it is because it matches basically every outfit. 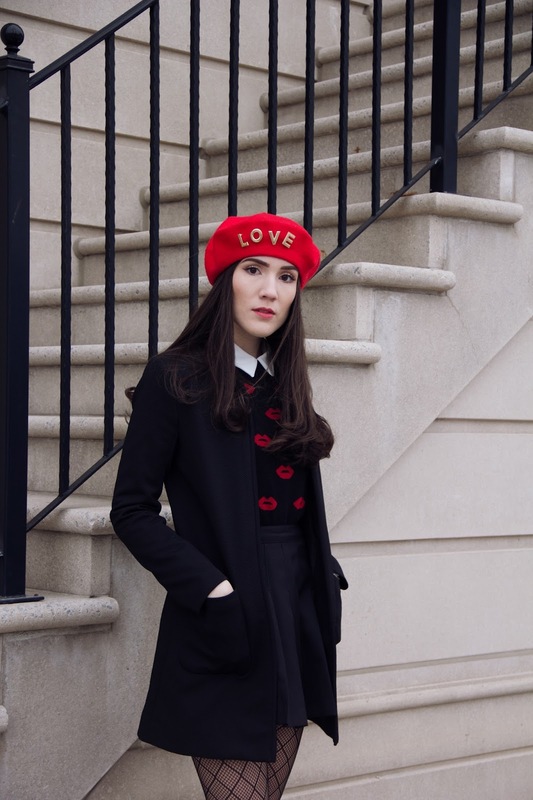 And for my favourite part of the outfit, the beret! I found this love brooch at H&M they are made up of individual letters so you can set it up however you want ! I decided to put them on a red beret and I LOVE (pun intended) how it looks! If you want to see this outfit in video I also posted a clip of it on my youtube channel ! link here. I hope you guys have a wonderful weekend, make sure you check out my Instagram for more pictures over the weekend ! 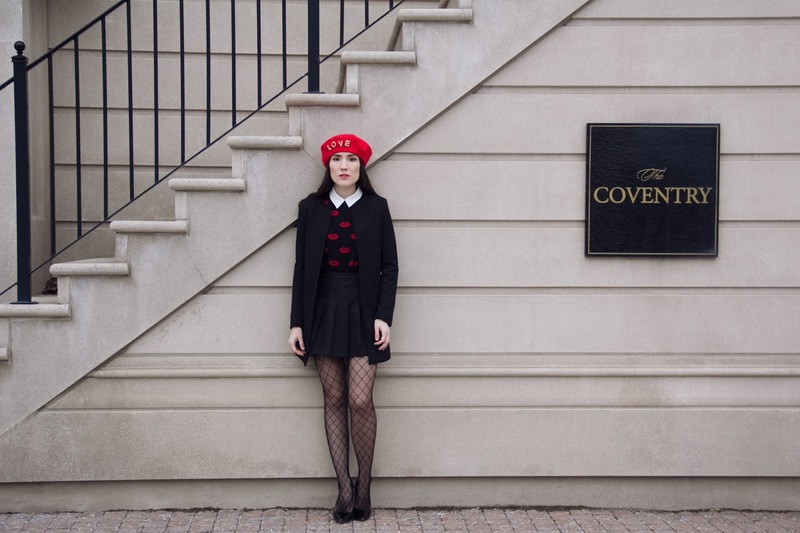 This entry was posted in Styling Patterned Tights and tagged Beret, black heels, black skirt, Carolina Pringlo, fishnets, love, patterned tights, Valentine's Day on November 22, 2017 by tightsreview.